Asphalt is meant to be durable and versatile, but unfortunately, from the moment asphalt pavement is laid down, it begins the process of deterioration. Since the parking lot is the first impression on customers who visit your place of business, proper maintenance and care is essential to preserving the integrity of your asphalt surface. The first step towards taking care of your asphalt is to understand what is actually causing damage in the first place. Water from adverse weather conditions, as well as sprinkler systems, will make an impact on your asphalt in the long run. If water seeps into a crack and into the base layer, it begins to deteriorate the structure of the asphalt. The elements that makeup asphalt are held together by a binder which is susceptible to deterioration by UV rays. Exposure to oxygen also starts the process of breaking down the material. Continuous temperature fluctuations in colder climates can minimize the structural integrity of your asphalt. Cracks appear on the surface, which allows water to seep in. On the other hand, dry and hot environmental conditions could be a significant cause of asphalt decay as well. Asphalt can suffer not only from excessive moisture but also from excessive heat and dryness. If the asphalt has the wrong asphalt compaction ratio: it will wear out quickly. If the asphalt lays on an improperly compacted base, its durability might suffer. In order to be effective, a sub-base should be able to withstand a certain amount of pressure, without soft spots. A proper sub-base is crucial to optimize water drainage and prevent irreparable damage. These common installation errors are an indication that the installation might have been rushed and without the proper quality, checks met. Large vehicles such as garbage and delivery trucks put significant weight on your asphalt. Once the asphalt starts to oxidize, it is impressionable to large loads. 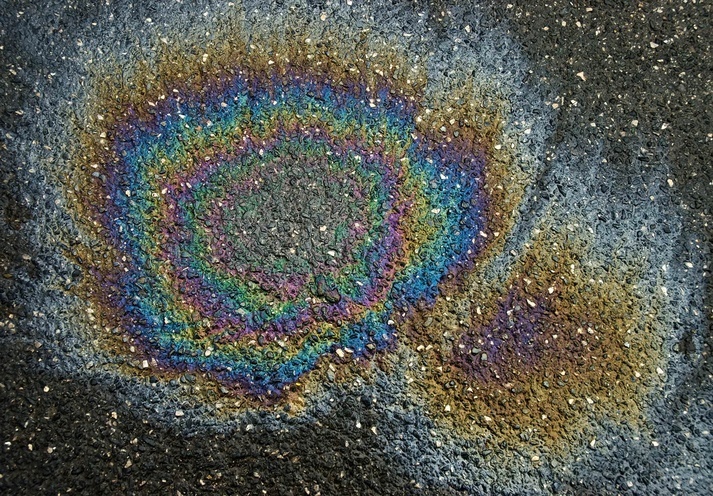 All parked vehicles can leak oil and this corrosive substance can degrade the asphalt surface.